Sounds to eliminate distractions and improve productivity. Is there a better alternative to DeepFocus? Is DeepFocus really the best app in Audio category? Will DeepFocus work good on macOS 10.13.4? 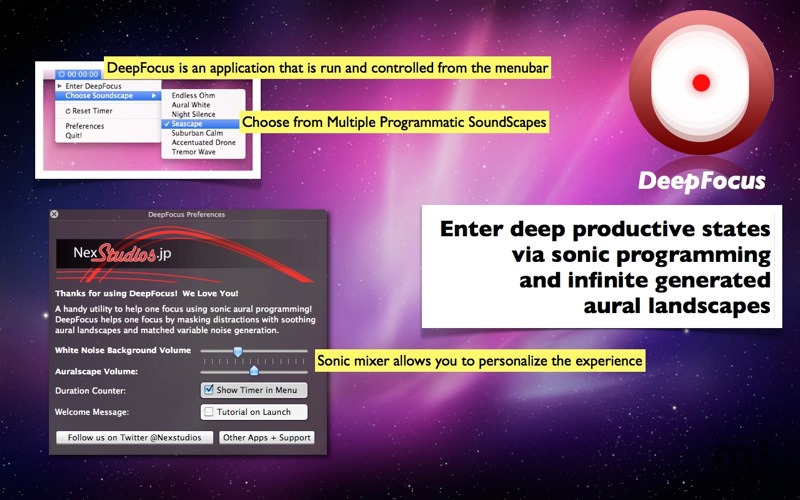 DeepFocus is a powerful concentration aide to improve focus, productivity and mask distractions with soothing aural landscapes and matched variable programatic noise generation. We worked with sonic experts to create programatic infinite aural landscapes designed to induce mental concentration and deep productive states. Soundscapes mastered professionally with matched sonic programming to induce the deepest mediative and productive focused states. Built by NexStudios. We use it daily and hope you enjoy it! Met with some experts on Brain Waves / Focus and Sonic Programming. Deep Focus now supports additional sonic auralscapes and allows you choose to enter varying productive states (Gamma, Beta, Alpha Brain Wave States). Support for Intel 32 Bit Macs. DeepFocus needs a rating. Be the first to rate this app and get the discussion started! This powerful application sits in side user Apple Menubars and triggers deep infinite aural landscapes that improve concentration, focus, and overall productivity. Enjoy and explore the infinite deep aural landscapes. Matched noise generation with deep aural landscapes induce a pensive mood for productivity and enjoyment. Recommended to use headphone to induce deep state or high quality speakers when using. Other features include work times, preferences, sonic mixer to adjust to personal tastes. Enjoy! Soundscapes tagged now by Brain Wave Category.